One of our daughter's books chronicles the life of a fairy including the significance of spring. As the snow melts, fairies come out of their warm hiding places and begin to spread their magic in our gardens, meadows and fields. According to the book it is because of their magic that flowers bloom. So, at this Fairy Party, we created hairbands with flowers as fairies themselves might wear. Then we moved on to Shrink Art! 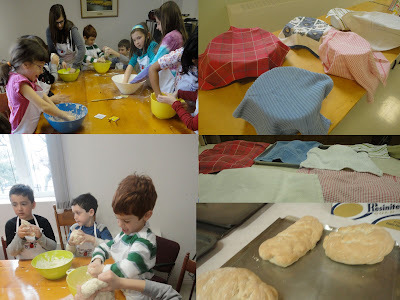 But we did something different this time (they were a big hit!) We made charm bracelets...everyone's was different but each had 3 Shrink Art Charms (a Monogram Crown, a Wand and a set of Fairy Wings) along with a selection of beads. 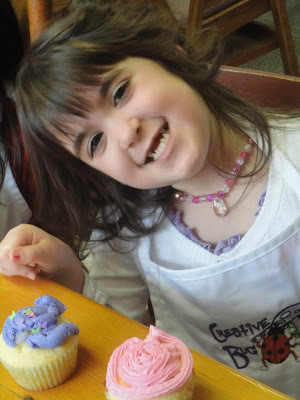 Here is the birthday girl with her cupcake...also decorated with fairy wings! This was a sweet bunch of girls! We had a lot of fun! 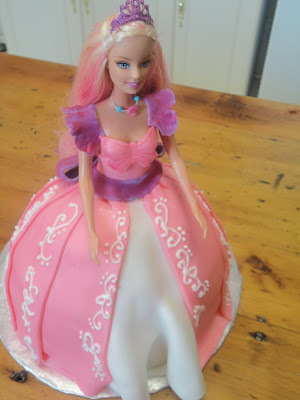 That song will live on forever in my head I think...I learned some lessons after doing my last Barbie Cake...about proportions mostly. This time I was happy with the skirt of the dress after the first try! So, I had a lot of fun creating this design. As I was working on the outer layer of the skirt I saw the opportunity for the ruffled back and just couldn't help myself! It was too much to resist. 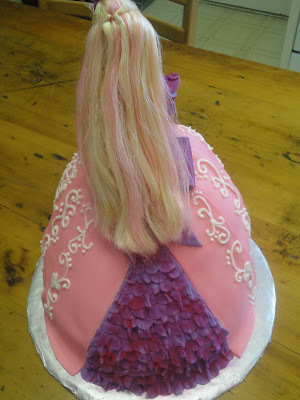 It's been awhile since I've had some alone time with fondant. ;) It was nice to have a chance to create something again! Creative Camp - Creative Science! When I started planning my March Break Camps I figured I better find something to include my middle son...we have so many fun workshops for the girls already! I hemmed and I hawed and I finally decided on Creative Science. The truth is, just because I choose a theme doesn't mean I know what it is going to look like. I choose a theme and then I start brainstorming. In this case, I even checked some books out of the library on science! A friend of mine who IS into science helped with the games. Here they are playing White Blood Cell Tag. This was a huge hit! These white blood cells are trying to chase down the nasty germs that are left! One of my favourite activities is Shrink Art (as if you didn't know that!) As hard as I tried...I could not find the science in it, they said it was magic on-line, in the packaging, everywhere! Here is some magic happening...the kids counted to 60 3 times while we waited for their work to shrink! The little guy up front instigated that! He was SO fun! Now, we needed to keep the kids active...here they are working on a Scavenger Hunt. They had to answer 20 questions about the science of our bodies. Did you know that teeth are our only bones that don't heal themselves? 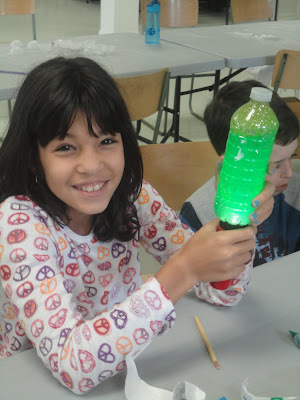 Lava lamps! These were super fun! Everyone loved this craft! Our grand finale were our Hover Crafts! I am so glad we did these they were SO fun (even if they did result in a headache and a number of head rushes from inflating all of those balloons over and over again! We raced them. Talked about the results, came up with some hypotheses and raced them again! Before we all left the kids finished their Science Journals (we worked on them throughout the day) and we review our day in full so parents could hear what we did as they came to collect their children. I had such a great time I am hoping to run a series of these once a week over the summer. Hope to see you there! I wrote to you last week...telling you that we are stuck. Well, we are still stuck but things are looking a little better. We have worked through some of the requirements with the town and found a way to reclassify ourselves so that these requirements are minimized but still focused on safety. Such a relief! So, I am asking you to help...go vote, leave a comment, 'like' my page. I am not judged on votes alone so while the numbers look great (there are higher ones out there), I am certain that your comments and 'likes' will help too. So please take a moment and vote, or take more time and vote daily, hourly, whatever you can do is great! Some moments I want to share with you...I love my sign. I am so proud of my business...and I wouldn't be here if it weren't for many of you. Help me stay here! Everyone knows I love Shrink Art...here are some girls watching their charms shrink! 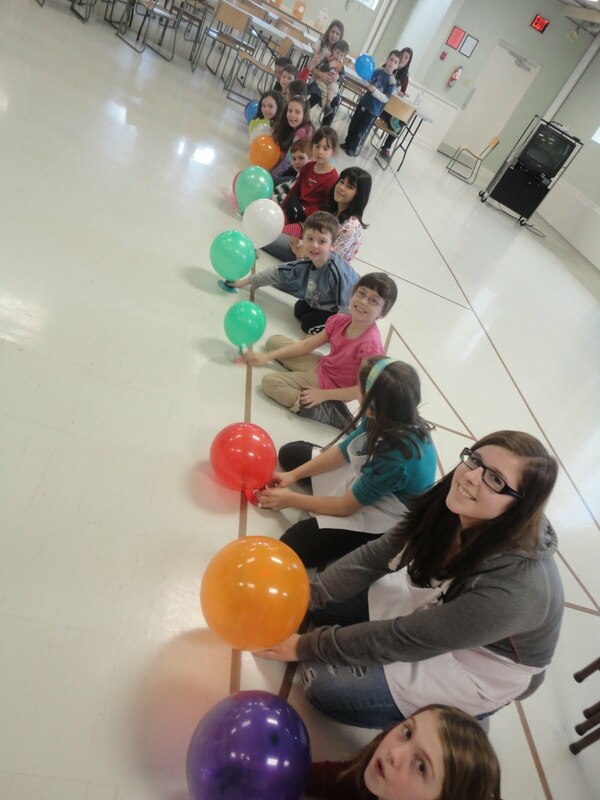 From our Creative Science Camp, we are ready for our hover craft races! 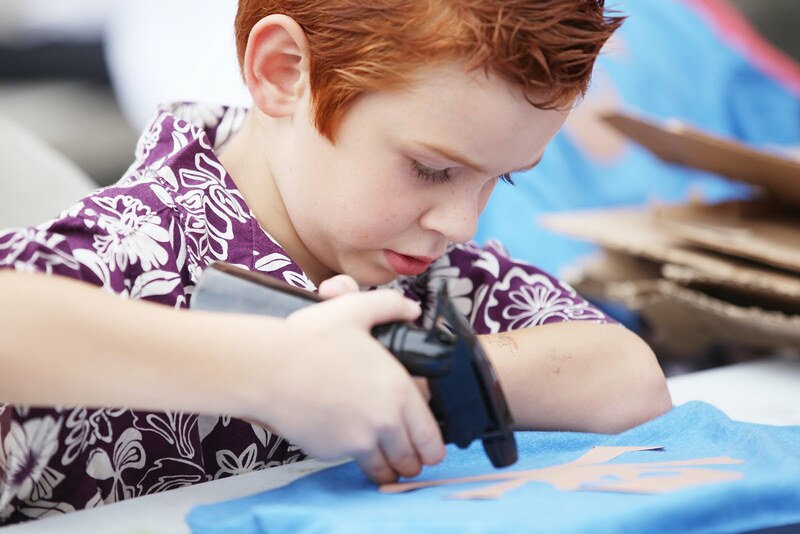 From Fashion Camp...what a fun day we had! They make me so happy...but every child who walks in my door and gets excited about being a part of Creative Bug makes me happy. I am so blessed to have all of you and have the opportunity to work with so many children. In 2 years we have had more than 40 birthday parties, we have made over 60 cakes...that's a lot of smiles! 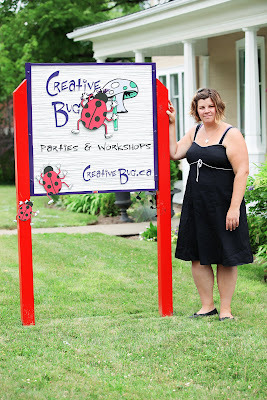 Please take a moment and vote for me http://www.scotiachallenge.projects.fm/entry/4104805-Creative-Bug. Things have been so crazy lately. And I don't just mean cupcake crazy! We have found our way around some of the renovation challenges but are still working on getting a permit so we can get the work up and moving again. In the meantime, I have been lucky enough to have a great location just across the street! On Tuesday we spent the morning thinking about cupcakes! We decorated our own bakery boxes...trying to create an image for each of the girls' own bakeries. And we baked, cupcakes of course! We made Mini-Oreo Cheesecakes, Cream Filled Chocolate Cupcakes, and Vanilla Garden Cupcakes. How lucky are the families of these girls to have fresh made dessert brought home?! We also made these super cute necklaces...I got the idea on And Everything Sweet. Everyone's necklace was different and super sweet! I am so glad that I was so busy this last week. It helped remind me why I built Creative Bug in the first place. 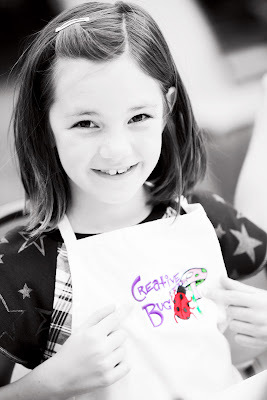 I can't think of a job I would rather do/have...Creative Bug grows every day, week, month, year just like my own children and the ones who stop in to create with us. After much deliberation, some of it rather loud and confrontational, the kids decided to make a Leprechaun House rather than a trap. I had told them that their trap shouldn't look like a trap if they wanted to catch him and this is what they came up with! Check out the portrait on the walls, there is a fridge and stove on one end. They also wrote down the features of this place including food, a bed (the brick), the gold...they are definitely sales people in the making! The food is marshmallows from the Lucky Charms Cereal...sweet! Well, it looks like our Leprechaun stopped by over the supper hour and got himself some grub! But this is the closest we got to see him. Some portraits done in food! The only gold at the end of our rainbow were Lucky Charms squares. We had to go to the grocery store on St. Patrick's Day especially for the Lucky Charms and marshmallows so we could make these! And these...we didn't have any ice cream in the house! So we made Peppermint Milkshakes, something for everyone here. Cheers to Patty O'Malley! I hope everyone had a fabulous St. Patrick's Day! This party was booked in 2010. Yep, this mother definitely plans ahead! 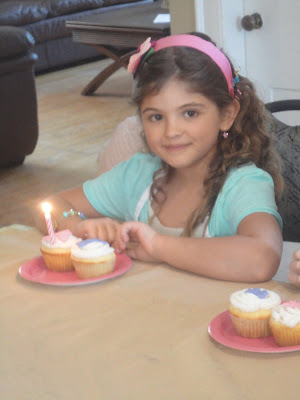 In fact, this is the second year in a row that we have been lucky enough to host a party for this young lady! Last year I had tonnes of fun with her Hollywood Theme and I knew she would choose another great theme for this year! Peace! If you want a totally different party, one of the tricks is to give me extra warning. 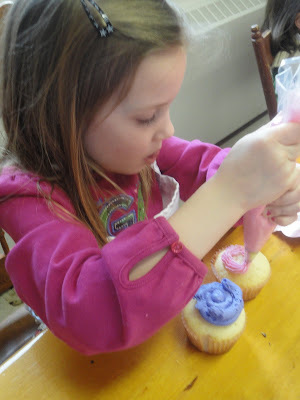 That way I can brainstorm over time and watch for ideas...and that's what this mom did! So first thing is first...let's get those cupcakes mixed up and in the oven! Now, I had my hands full helping the girls so there aren't a lot of photos here but if you check out the work on the table you can see what we did. We made mini-bulletin boards that look like peace signs (using peace ribbon no less). THEN! We got out my bottle cap collection and decorated some bottle caps to use on top of the tacks. The party was jam packed but we sure had fun! Maybe we'll see you again next year! So, on Saturday I enjoyed a break from our most recent hockey tournament and spent some girl-time with these cuties! How cute is the birthday girl??? It was a lot of fun and the girls took the change in location in stride! Thank you for being so understanding while we are under construction! Just over a week ago we started renovations. They seemed simple enough. We were going to make my workshop everything I needed/dreamed of. Easy, right? Maybe not. After beginning work last Saturday night I headed to the Town office on Monday morning to get a permit. It appears as though I said an ugly word. One word. Commercial. It would seem that honesty doesn't do much good in these cases as I have had many contractors shake their heads knowingly at me. So, here I sit with my workshop gutted, a couple of walls framed, plumbing and electrical ready for the next phase...here I sit in a deadlock. You see there are some regulations that are up for interpretation and those regulations could mean the end of Creative Bug. I am not trying to be melodramatic here. We are a single income family. Creative Bug is a fledgling business. After 2 years of running the business at my pace I was heading toward a profit. But we cannot possibly absorb the sort of expenses that they are talking about into our household budget. I have a party tonight and a couple of workshops coming up this week but after that? It's hard to say. I have a cake or 2 that I have committed to, which will now have to be baked off-site. I love what I do now more than I ever thought I could...and there are other avenues that I can take the business without the workshop but boy is this ever breaking my heart. Nothing will ever compare to spending PD Days with the kids I have gotten to know. So, now....more than ever I need you. All of you. 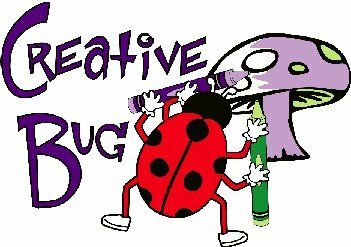 Please take moment for Creative Bug and what it means to you and maybe, just maybe...Creative Bug will get through this.